On a global scale, Ginger is one of the most widely used therapeutic agents. Its healing powers are used in a diverse medical system such as Traditional Chinese Medicine and Ayurveda. CO2 extracted Ginger contains some of the sharp water soluble components such as gingerols and shogaloles. These are not present in the distilled oil. The CO2 extract is therefore somewhat irritant and needs to be blended wisely for topical applications. The CO2 extract is somewhat viscous and it takes patience for it to drop. Considering the pungent nature of the Ginger extract, actually a welcome feature, because it makes it easier to limit the amount to one or two drops. 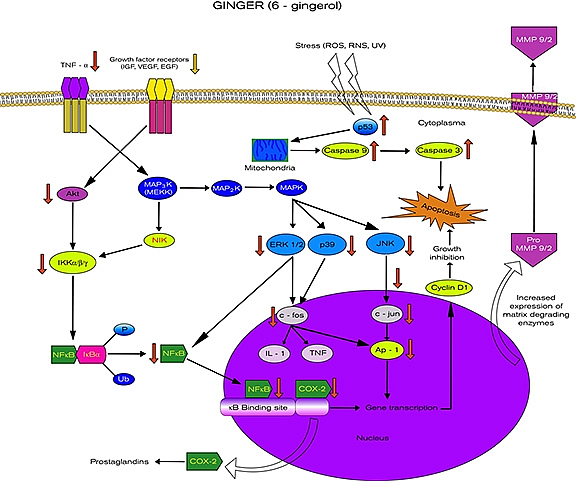 The above graph is typical for modern molecular biology, representing the actions of Gingerol 6, inhibiting inflammatory processes inside the cell.